If one had a penchant for statistics, he’d find some astronomical figures in the number of miles traveled, total in attendance, size of box-office receipts and the myriad of details that each year go into the busy schedule of concerts that takes Art Ferrante and Lou Teicher from one end of the country to the other with a criss-cross patchwork of applause-filled stops along the way. One reason for their continuing and ever-widening popularity is the care they give to their repertoire. 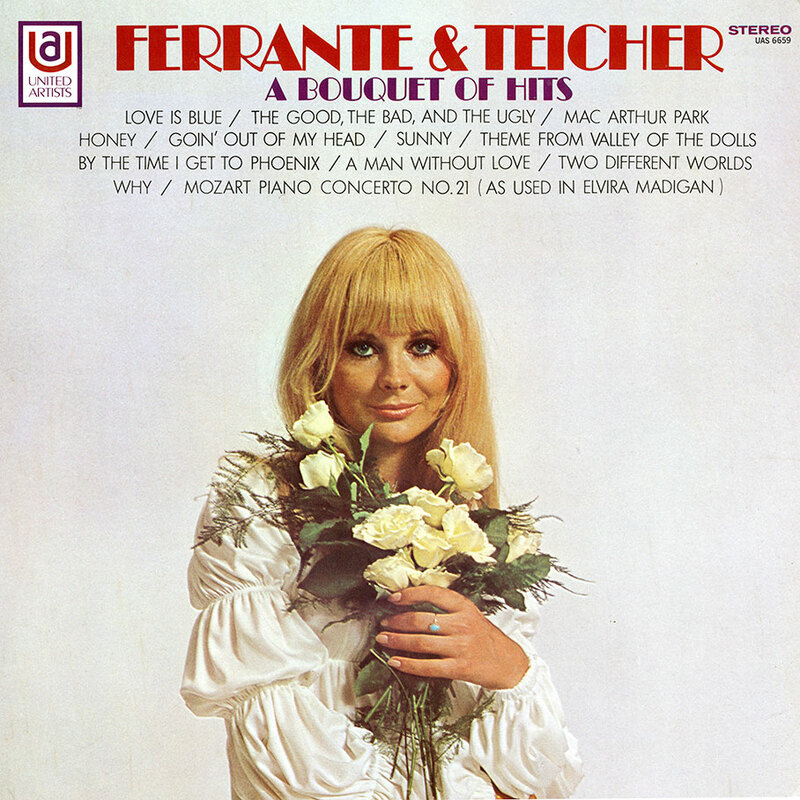 Constantly attuned to the public taste, Ferrante and Teicher select eh tunes that people want to hear. Next, they go about arranging the tune to fit their unique two piano styling and set this in an orchestral framework for all to enjoy. This album, called A Bouquet of Hits, is an offering much like a floral display… songs with petal-like softness, the sharpness of a beautiful rose’s thorn, the durability of evergreen, the changing patterns of a multi-hued garden and the revolution of life and growth itself. In this bouquet you will find some of the most popular hits of the past year. If they weren’t on your personal hit parade before, they’re sure to be after hearing them performed in the distinctive style of Ferrante & Teicher.